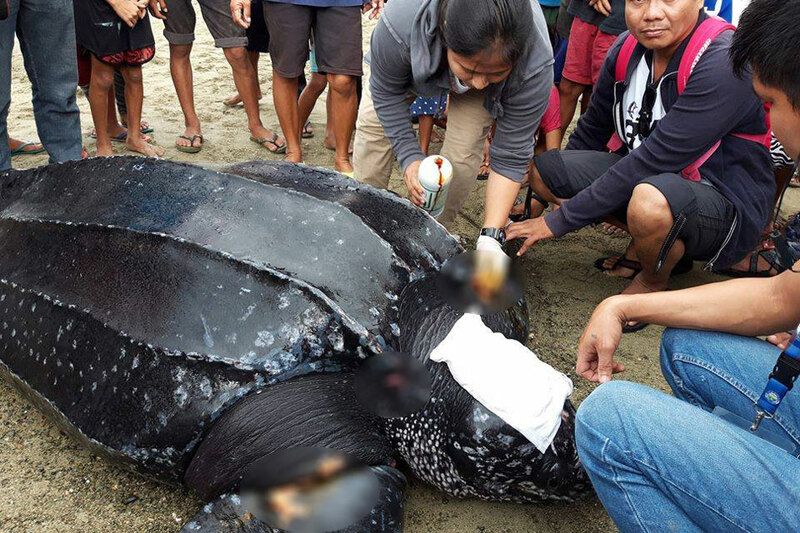 BALATAN, Camarines Sur -- Fishermen off the coast of Duran village in this town accidentally caught a wounded leatherback turtle in their nets Thursday morning. Fisherman Albert Pasamba brought the 4-foot long, 370-kilo female turtle to the shore and sought help from local environment officials. The turtle sustained a shallow wound on the neck and on one of its fins, said Norielet Reciproco, the local environmental management specialist. The cause of the wounds remains unknown. "Pag humihinga siya, tumataas ang ulo. Indication ito na healthy pa," he said after treating the turtle's wounds and returning it to the sea. The sub-population of leatherback turtles in the West Pacific Ocean is listed as "critically endangered" by the International Union for Conservation of Nature. "This West Pacific Leatherback subpopulation has declined 83.0% during the past three generations," the IUCN said in its 2013 assessment. Among the threats to this species are incidental capture in fishing gear, fishing of its eggs, human-induced alteration of coastal environments, marine pollution, and climate change. Reciproco said the fact that this was already the third sighting of a leatherback turtle in their waters this year just means they have a healthy sea. "Ang kinakain nila jellyfish. Ibig sabihin healthy pa ang dagat, ang bahura ay marami pa, dapat i-release para lalong dumami at 'yun 'yung nature nila," he said.